Today, prototypes of the speakers were shown off at Ikea's Democratic Design Day event in Sweden and they're … well, interesting. 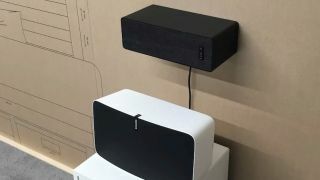 There will be a number of speakers in the range - which Ikea says will be more affordably priced than regular Sonos speakers - with the one pictured up above doubling as a shelf or hang beneath a kitchen cabinet without seeming out of place. The motivation behind SYMFONISK is to create a series of speakers that “save space, get rid of cords, make clutter invisible, and bring sound and music into the home in a more beautiful way” according to Björn Block, Business Leader for Ikea Home Smart. SYMFONISK's debut follows yesterday's announcement of the Sonos Beam, a slim smart soundbar that conveniently fits underneath your TV that's developed exclusively by Sonos that comes out on July 17. While it's still early days for the SYMFONISK, Ikea certainly has a creative idea driving the innovation. That idea, partnered with the design company's penchant for fitting furniture together in a utilitarian way, bodes well for the final product. Beyond the addition of Sonos system compatibility, Ikea says that the SYMFONISK will also support its line of Trådfris smart home line of lights and switches. The SYMFONISK is the second speaker collaboration for the Swedish furniture maker after its first project, the Eneby series of speakers, hit stores earlier this year.